Save 10% when you purchase 2 or more jars! Kids Clear™ is 100% pure bentonite clay which has the highest cation exchange capacity (CEC of 98-107 meq/100g) of any bathing clay that we tested on the market. This means it has a very high ionic surface charge when mixed with warm water. This clay is high purity air-classified sodium bentonite, selectively mined, consisting of micronized particles which is a free-flowing powder. Kids Clear™ Cleansing Clay meets all requirements set forth by the USPXXIII/NFXVIII for bentonite. Key Benefits of Kids Clear™ Clay Baths! Kids Clear™ Cleansing Clay has no added ingredients. This is a 100% pure and natural product. To view our 2.5 lb jar product label, which is FDA compliant, please click here. Kids Clear™ Cleansing Clay contains no spices, herbs, excipients or fillers which sometimes cause allergic reactions in sensitive individuals. Kids Clear™ Cleansing Clay is guaranteed to be free of bacteria, viruses, molds and yeast. No other bathing clay on the market makes this claim. It is important to find “purified” clay for bathing, and this is especially true if you are sensitive to molds or yeast, or have a weakened immune system. Kids Clear™ Cleansing Clay has the highest cation exchange capacity, or negative ionic surface charge, of any clay we have tested (98-107 meq/100g on the CEC scale). Mixing Kids Clear™ Cleansing Clay with very warm water creates a high negative ionic surface charge. 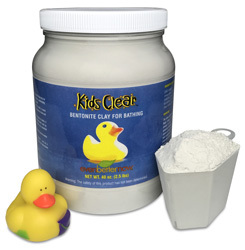 Unlike most bentonite clays, Kids Clear Cleansing Clay disperses easily in water, with virtually no clumping. This is highly desirable, since there is little mixing required and the clay does not adhere to the skin the same way other bathing clays do. Kids Clear Clay Baths may be more effective than a “clumping” clay since it has a bigger exposure of its surface area, giving it an exceptionally high absorption rate. Unlike other bathing clays, this clay can be safely rinsed down the drain. No drain guards or special cleaning or clay dissolving agents are required. Precautionary note for septic system homes: If you are on a septic system, we recommend using the clay in a foot bath and not in the tub as your septic system warranty may be voided if clay is put down the drain. Even though our clay blends well with warm water, Evenbetternow, LLC will not take responsibility for problems with your septic system. Therefore please use at your own discretion if on a septic system. Under normal conditions, clay will not stop up your septic system if it was designed adequately and is working properly. The heavier clay particles will never get to the leach field. They will settle by their own weight to the bottome of the septic tank compartments. It would take many years of clay baths before significant buildup would dictate tank plumbing. However, it is important that if you do use clay in a tub bath, not to flush lumps of clay down any drain. Call us at (520) 877-2637 between the hours of 9:00am and 4:00pm Pacific Standard Time March through October, and Mountain Standard Time November through March.